A flattering haircut is one of the easiest ways to play up your best features. We all have different features we want to play up (or perhaps play down). And a flattering haircut is one of the easiest ways to achieve that. Here, some tips from a few ladies—of all face shapes and sizes—who know a thing or two about looking good. The goal: To create length and make your face appear more slender. Ask your stylist for long, face-framing layers or a side part like Emma here. (Nothing should be shorter than your jawline.) Also, keep your dry shampoo on hand as a bit of volume at the roots will add height to the top of your head and help to balance out your cheeks. You are the rare species who can pull off any cut, so have fun and switch it up from time to time. (Halle here has had everything from an angled pixie to near-waist-length curls.) Try a full set of fringe bangs for the fall and sweep them to the side as they grow out in the spring. Or keep your hair long now and chop it into a piece-y lob later. The world is your oyster, you perfectly symmetrical creature. When Zoey gets bangs, she commits to it. The heavy, ear-to-ear fringe spans the width of her face and balances the length of it. 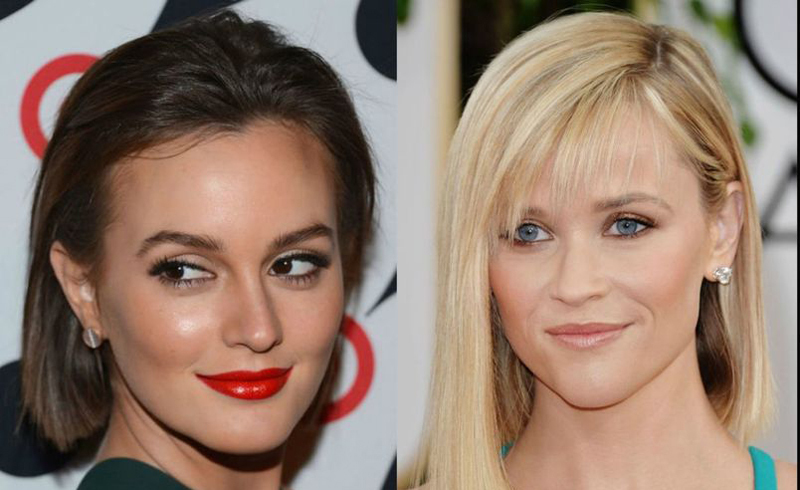 Bangs or no bangs, keep the rest of your hair layered with a bit of texture and volume starting at the cheekbones. By adding dimension, you’ll visibly shorten your face and create symmetry. The length is up to you. But whatever you choose, make sure your ends are tapered so the hair doesn’t look heavy and weighed down (which can draw attention to a stronger jawline). Wispy layers and long side-swept pieces (Lucy’s go-to) soften the edges of the face and minimize the width of the forehead to create a more rounded appearance overall. Unlike rounder face shapes, heart shapes do better with a style that lies flatter at the top and gets fuller at the bottom to balance out pointier chins. Do as Zoe does and keep layers long and curled away from the face to get this effect.